We arrived at Kelso In the Tamar Valley near the mouth of the Tamar River to spend two days, before we had to move on to Ulverstone. Now that we are at Kelso, had we known, we could have booked in here for six days. It is a lovely Big 4 caravan park, with promises of wildlife. Our site is on Wombat’s Way! 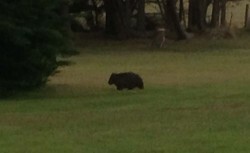 and wombats there were. Russ said that he’d have to get some womballs, to have a game. (They don’t get any better, but they’re fun). A place to see from here was the Narawntapu National Park. We have stayed at Bakers Beach last time, but Kelso is at the Northern end of park and after a short drive, Russ was able to walk to West Head and Badger Beach. Narawntapu became the first Tasmanian park to revert to its Aboriginal name. 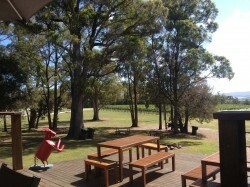 We also went to Goaty Creek Winery, where we had ordered a gourmet platter for $60 for two. The wines were delicious, but expensive. We chose a wooded chardonnay to accompany our smoked salmon, ham, olives, pate, terrine, some cabana (which we could have done without) and lovely cheeses, biscuits and a small stick loaf of bread. 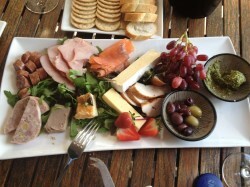 It was delicious, but didn’t compare with our Wahgunya platters, for the same price. We then moved to Ulverstone, which was quite a surprise. A much larger shopping centre, an incredibly busy, but well run caravan park, coping with the Easter influx and more to do from here than we thought. We thought this would be just filling in time, but we drove out to Leven Canyon, where Russ walked 2 x 700 steps, but he said it was worth it. Yesterday we went to Gunn’s Plains Caves, had a picnic and spent a couple of hours relaxing in a beautiful setting, but didn’t go into the caves. Not our thing! 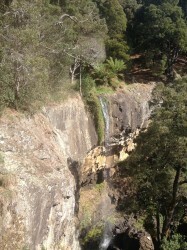 Today we drove to Preston Waterfall. A steep, short walk to the falls, which Russ saw, but then we drove back to Ulverstone to one of the many tables around the beach. The wind was freezing, but we can’t complain about the weather – it has been outstanding. Tomorrow, it’s the ferry, boarding at 5pm, then home at 7am on the 30/3. 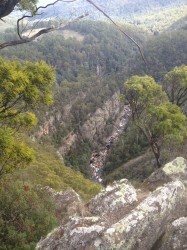 We don’t do as many exciting things now, but we have really enjoyed Tasmania and we both love the people. We haven’t met an unfriendly person once.